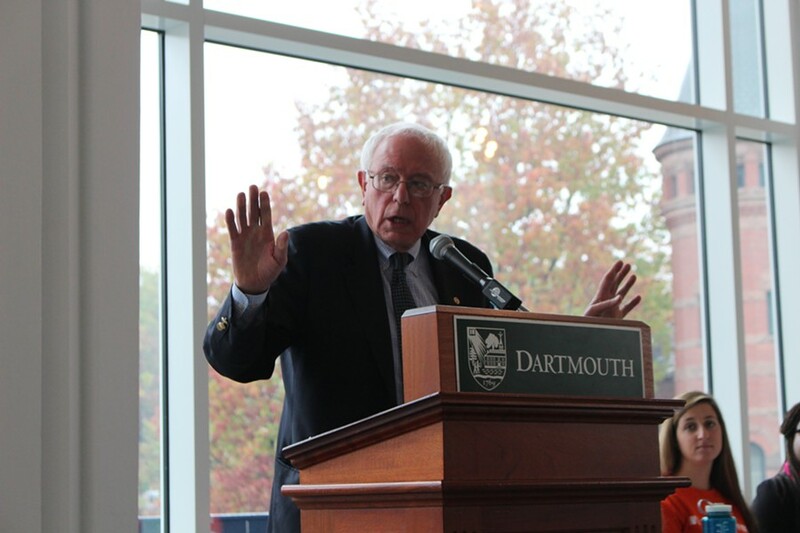 Sen. Bernie Sanders speaks at Dartmouth College Thursday. It was billed as a get-out-the-vote rally ahead of New Hampshire’s closely contested congressional elections. But in 50 minutes of remarks Thursday afternoon at Dartmouth College, Sen. Bernie Sanders (I-Vt.) only once mentioned the race that could determine control of the United States Senate: incumbent Sen. Jeanne Shaheen’s (D-N.H.) showdown against Republican Scott Brown, the former senator from Massachusetts. And Sanders didn’t even mention Shaheen’s name. The subject came up 40 minutes into the Vermonter’s stump speech, as he hailed the progress he believes women have made in American politics. The rest of Sanders’ speech appeared focused on getting out the vote in another race: the 2016 presidential election. His visit to Hanover marked his seventh day in New Hampshire this year — and his fourth this month alone. On Tuesday, he visited Keene State College and, later Thursday, he was scheduled to appear at Plymouth State University. Sanders hasn’t confined his pre-presidential travel to the home of the first-in-the-nation primary. Earlier this month, he took his third trip to Iowa, which holds the first presidential caucuses, dropping by Davenport, Coralville and headlining a Johnson County Democratic Party barbecue in Iowa City. Just last week, Sanders made his first trip to Nevada, which holds the second round of presidential caucuses, and to California, where he spoke at three events in the Bay Area. At Dartmouth, some 75 students and Upper Valley residents gathered on the second floor of the Hopkins Center for the Arts to hear Sanders deliver a subdued speech touching on all his usual themes: economic inequality, the growing influence of millionaires and billionaires, the failings of the news media and, of course, Charles and David Koch. 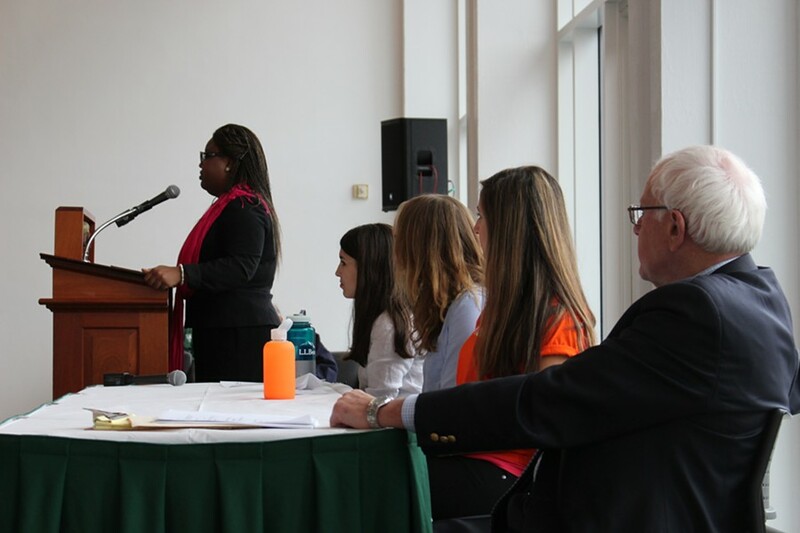 Sen. Bernie Sanders listens as Dartmouth students introduce him. Inevitably, the subject of his own presidential ambitions came up — though it was raised by a Vermonter, not a New Hampshirite. To that, the previously quiet audience burst into applause and someone standing in the back of the hall let out a loud whoop. By at least one metric — fundraising — Sanders doesn’t appear to be growing more serious about running. In July, the senator reported raising nearly $716,000 for his campaign committee in the previous three months and another $9,242 for his political action committee, called Progressive Voters for America. That was a record for a year in which he did not face an imminent race for reelection. But last week, Sanders reported raising just $152,000 for his campaign committee last quarter and another $27,000 for his PAC. He spent a combined $166,000 from both accounts, mostly on campaign staff, airfare, hotel rooms, meals, office space and rental cars. Sanders reported one distinctly presidential campaign expense: He paid Texas-based Landmark Aviation $11,128 to charter a plane last month from Washington, D.C., to Wisconsin. According to spokesman Michael Briggs, the charter was necessary to honor his commitment to attend the Fighting Bob Fest in Baraboo, Wis., on the same day he taped an appearance on NBC's "Meet the Press." Sanders also contributed $12,500 to the Vermont Democratic Party last quarter and $36,500 to political candidates — mostly Senate Democrats facing tough campaigns.